At 11am on Saturday, February 20th, in UCLA's historic Royce Hall, AYS will present its fourth annual children's concert, a true Family Music Adventure! 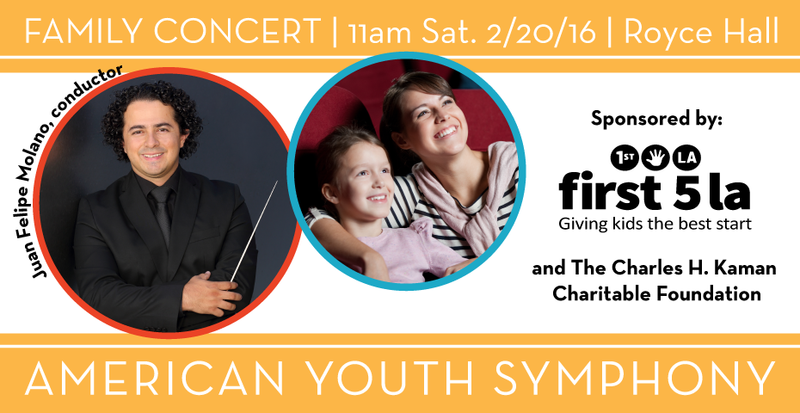 Los Angeles, California, February 2, 2016	(Newswire.com) - On Saturday February 20th, at 11am, the American Youth Symphony will present a 45 minute concert including Benjamin Britten’s The Young Person’s Guide to the Orchestra, designed to entertain and engage young children and classical music enthusiasts of all ages. Event co-sponsor First 5 LA will be leading arts & crafts activities in the Royce Hall West Lobby following the performance. This concert is the perfect way to share classical music and create a lasting legacy for the next generation! Admission is complimentary, eliminating all barriers for children and families to experience the inspiring power and beauty of a live orchestra performance. This concert officially kicks off Maestro Juan Felipe Molano's first season as a Resident Conductor with the American Youth Symphony. Maestro Molano is currently the conductor of the Los Angeles Philharmonic's Youth Orchestra Los Angeles (YOLA), and previously held that position with the Colombian Youth Philharmonic, Youth Orchestra Salinas (California), Caldas Chamber Orchestra, Cali Youth Philharmonic and Bogota Youth Philharmonic. During 2008-2013 he was the National Orchestral Director of Batuta Colombian System of Youth Orchestras (El Sistema - Colombia). Now in its 51st season, and heralded by KUSC’s Jim Svejda as “The finest youth symphony on earth” the American Youth Symphony's mission is to inspire the future of a timeless art form. The orchestra provides paid fellowships to 100 musicians ages 15-27 who represent extraordinary talent from all over the world.